John Blacklock For 47 years there has never been a Quantock bull sale without a Blacklock behind the “mic.” A generation ago it was John’s dad, Jock, who sold what was then a Hereford Bull Sale, but for more than 30 years John was the man behind the “mic” for Canada’s largest bull sale the last Saturday in January. Over the years John was the man behind the “mic” for many historic moments at our sale. When we were the first private sale in Canada to sell 200 bulls in 1985, John was on the mic, when we were Canada’s first 300 head bull sale in 1990 it was John; 400 bulls in 1995 well you get the picture, he was the man to pioneer selling at such a rapid pace, a bull every 48 seconds and several years ago he sold his 10,000th bull for our family. John has shared many firsts with us. 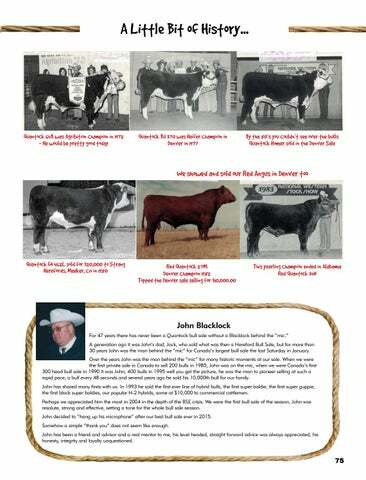 In 1993 he sold the first ever line of hybrid bulls, the first super baldie, the first super guppie, the first black super baldies, our popular H-2 hybrids, some at $10,000 to commercial cattlemen. Perhaps we appreciated him the most in 2004 in the depth of the BSE crisis. We were the first bull sale of the season, John was resolute, strong and effective, setting a tone for the whole bull sale season. John decided to “hang up his microphone” after our best bull sale ever in 2015. Somehow a simple “thank you” does not seem like enough. John has been a friend and advisor and a real mentor to me, his level headed, straight forward advice was always appreciated, his honesty, integrity and loyalty unquestioned.